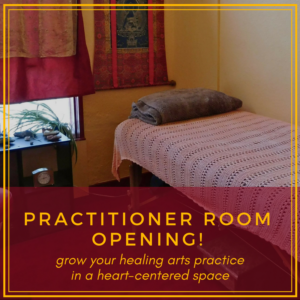 SomaSpace: Movement Arts & Healing Center has a practitioner room available for rent! ~Massage therapy, acupuncture, naturopathy, plant medicine, herbalism, shamanic healing, holistic health coaching, bodywork, spirit counseling, aromatherapy, and other healing modalities. ~Must be comfortable with quiet classes during the day and louder classes at night in the movement studio.